Forbidden Root Brewery Announces New Year-Round Beers and Transitions to All-Can On-Shelf Distribution - Solstice Communications, Inc. 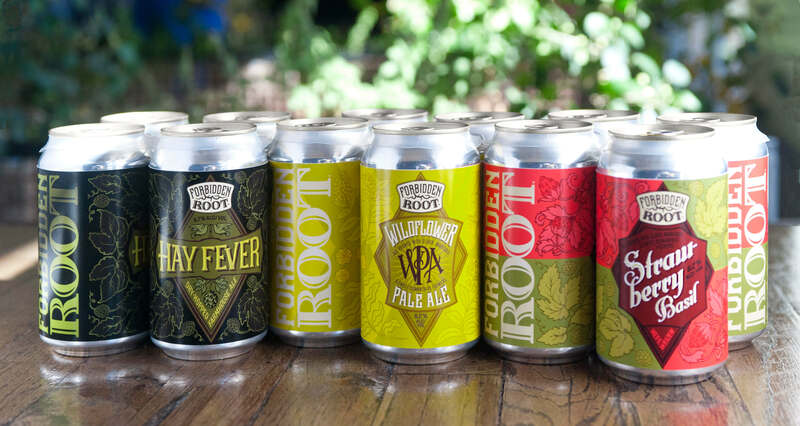 Forbidden Root Brewery, an innovator in craft brewing with its restaurant and brewery located at 1746 W. Chicago Ave., Chicago, Illinois, is adding two new beers to its core retail line-up and moving all beers for on-shelf distribution into cans, beginning the first week of April. Beginning in April, all beers in Forbidden Root’s core line-up will be available at on-shelf retail exclusively in 12-ounce cans, including: WPA, Wildflower Pale Ale (6.2% ABV), brewed with elderflower, marigold and sweet osmanthus plus new fan-favorites Strawberry Basil Hefeweizen (5.1% ABV), a delicious wheat ale with strawberry,basil and hibiscus and Hay Fever (5.9% ABV), a very drinkable dry-hopped farmhouse ale. Portability:from the beach, to hiking, to golf courses, cans are often able to go places bottles cannot. Sustainability:cans are lighter than bottles, reduce CO2 emissions in shipping and are incredibly recyclable (did you know a recycled can could be back on the shelf in 60 days?). Freshness:cans block light and are an effective barrier to oxygen, meaning the only thing limiting the freshness of the beer in the can is the time it takes to get from the brewer to a beer lovers mouth/glass. Design: Forbidden Root has an incredible storyteller on our staff – Randy Mosher. His ability to tell stories by way of graphic and label design is legendary in the craft beer industry. The canvas for aluminum cans is different than bottles and provides a unique artistic medium perfect for Randy. Look for 4-pack, 12 oz cans of these styles on the shelves of your local craft beer retailer. In addition to cans, there will be draft offerings of these styles at bars and restaurants across Chicagoland.